It is the year 2059. Several major world cities are under the control of a security force called Scion. 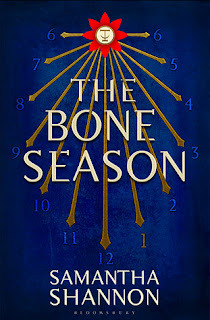 Paige Mahoney works in the criminal underworld of Scion London, part of a secret cell known as the Seven Seals. The work she does is unusual: scouting for information by breaking into others’ minds. Paige is a dreamwalker, a rare kind of clairvoyant, and in this world, the voyants commit treason simply by breathing. But when Paige is captured and arrested, she encounters a power more sinister even than Scion. The voyant prison is a separate city—Oxford, erased from the map two centuries ago and now controlled by a powerful, otherworldly race. These creatures, the Rephaim, value the voyants highly—as soldiers in their army. Paige is assigned to a Rephaite keeper, Warden, who will be in charge of her care and training. He is her master. Her natural enemy. But if she wants to regain her freedom, Paige will have to learn something of his mind and his own mysterious motives. 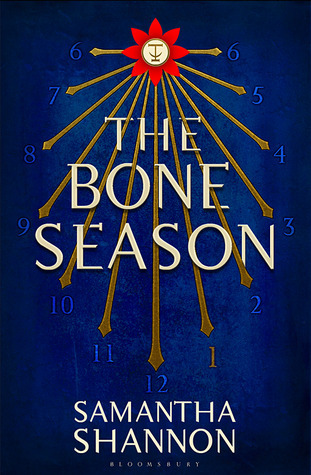 The Bone Season introduces a compelling heroine—a young woman learning to harness her powers in a world where everything has been taken from her. It also introduces an extraordinary young writer, with huge ambition and a teeming imagination. Samantha Shannon has created a bold new reality in this riveting debut. I really wanted to love this book. The premise sounded so interesting, but after attempting to read it three times, I found I just couldn't finish the book. It's one of those times where I think it was more my reading mood the then the writing. Try as I might, I couldn't get past the first three chapters in this book. It had a lot of action, but like with a lot of Dystopian books, this had a lot of world building, and it just lost me. I wanted to like Paige, because she seemed like a really tough & independent heroine, but I ended up just not caring what happened to her. I always try to get at least 40% through a book like this one before giving up because I realize that the start of a new series is always slow, and that world building takes awhile to do, but I just didn't have the strength to do it for this one. Maybe when I get out of the reading funk I'm in I'll go back and read this one, because it does sound like something I'd enjoy, but unfortunately right now it just didn't work for me.